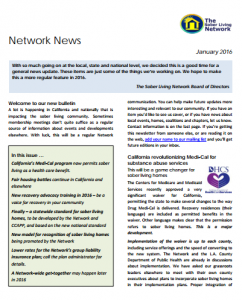 Welcome to our new bulletin. A lot is happening in California and nationally that is impacting the sober living community. Sometimes membership meetings don’t quite suffice as a regular source of information about events and developments elsewhere. With luck, this will be a regular Network communication. You can help make future updates more interesting and relevant to our community. If you have an item you’d like to see us cover, or if you have news about local events, homes, coalitions and chapters, let us know.